A small sample of Neil’s wood pile. 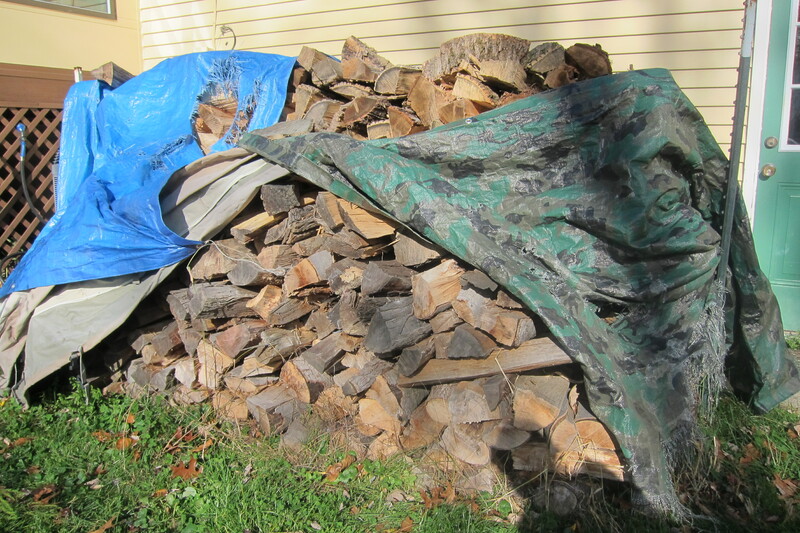 This post was written by Neil, whose free firewood acquisition skills saved us hundreds this year, and keep us warm and cozy through our long winters. Here he’ll share about the best wood-burning equipment available and how to come by this fuel for free. Nothing is better on a cold winter’s day than warming yourself by a wood fire roaring in an efficient apparatus in your home. Especially if you’re a thermostat miser like me and free firewood is your only hope of thawing out in a blazing 75-degree room. A warm blaze also offers free entertainment for many of the social functions we host throughout the year. Depending on where you live, firewood can be an excellent primary or secondary heating source. Two years ago I spent $200 on a cord of wood. This past year, I’ve collected a cord for essentially free, and I’ll use it to reduce my gas bill for heating throughout the winter. Help fuel your way to FIRE (financial independence/retire early) with free firewood. 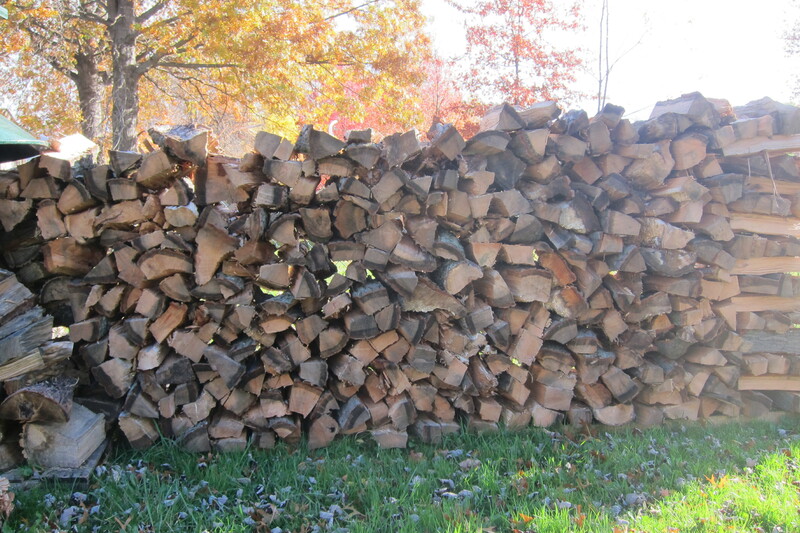 To determine if firewood is a good heating source for you, take a look at the equipment you already have in your home. First, of course, you’ll need an apparatus to burn wood. There are many different kinds. Regular fireplaces, fireplace with heat exchanger, wood stove, wood stove insert, wood furnace, outdoor wood furnace, even wood-fired boilers. Most people have just a regular old fireplace. Unfortunately, this is not a viable way to heat your house, or even supplement with wood. Regular fireplaces use huge amounts of air from your house to burn the wood and push the smoke up the chimney. This causes the wood to burn quickly and attractively but is very inefficient. The air in your house is finite and generally sealed from the outside, meaning the air will be drawn in through leaky doors, windows, and outlets. Really nice fireplaces solve this problem by having a special duct from under the fireplace or through the wall to allow outside air into the fireplace and then up the chimney. This is a great improvement; however, very little heat will actually be transferred into the house without some sort of heat exchanger. The cozy grate heater is the entry level into efficient wood heating. Next up in terms of efficiency is the wood stove fireplace insert. This is basically an approximation of a true wood stove shoved into the space your fireplace goes. It is way better at heating your house because not only does it have a heat exchanger, it also is much better at regulating how much air is being drawn from the room. This means it uses way less fuel while creating more heat. Even more efficient is the wood stove. A wood stove generally has the largest heat exchanger and ability to regulate air flow, making it the best choice for anyone who depends on wood for heat unless y get really serious and upgrade into wood burning furnaces and boilers. I could barely fit this pile in one photo. Getting firewood, like anything, can be about as cheap or expensive as you’d like. There is a local guy near me who sells pieces of wood for 50 cents apiece, ouch. Careful watching of Craigslist, however, can yield almost free wood provided you’re willing to do some work for it. Set up a notification with the keyword “firewood” for your city’s free section. CL rules apply for firewood, too: don’t drive far. Aside from CL, keep your eyes and ears open. Once people know you’re the family that takes firewood, you’ll start getting offers. Let word of mouth brings you tip-offs from friends, acquaintances, and family members who are looking to get rid of wood. Also, listen for the sound of a chainsaw. It’s unmistakable and can be heard for miles. If you can track it down, you’ll likely find a good source. Keep your eyes peeled for wood on tree lawns, plus fallen or felled trees in people’s lawns. I’ve been known to knock on doors, asking homeowners if are looking for help getting rid of unwanted wood. Stop by your city’s brush drop off site; I regularly fill my hatchback with pine (for outdoor fires) and even good hardwood from ours. Get in touch with local arborists. They often have to pay the dump to take wood after a job! They’d be happy to hand it off for free or a nominal fee. Don’t be afraid to ask, worst they can say is no. You’ll often have to be willing to haul, split, and stack wood yourself, but it’s all part of the fun. As the old saying goes, wood warms you once when you split it and again when you burn it. I’d add it also warms you when you move it from your car to the yard, when you stack it after splitting, and when you move it into your house for the blaze. It’s all part of my winter exercise routine. You won’t see me on a treadmill; I enjoy exercise that is outdoors and productive. There’s a real satisfaction when a sharp ax busts through a thick log. I recommend the Fiscar’s long-handled ax and a decent canvas log carrier. I also recommend cleaning out your chimney every season or so. I use this: http://www.amazon.com/Gardus-RCH205-Sooteater-Chimney-Cleaning/dp/B0010H5JXA/. If this is all too much for you or you’re unable in your current situation to burn, get one of these: http://www.amazon.com/Yule-Log-n/dp/B00E4V0IW6. There is something quite mesmerizing and universal about staring into the flames of burning wood. Christmastime isn’t complete without it and it might even save you some dough on your next heating bill. Just make sure not to pay much for your fuel and enjoy the exercise it provides. What are your tips for getting firewood? What other ways do you offset heating costs? We can’t have a fire because of Tim’s asthma. Which is fine in Phoenix, I suppose. Up in Seattle, it would’ve been nice. Before I met him, I lived in a place that had a lovely wood-burning stove in the living room. It made that area awfully nice and toasty. That said, it rarely got lit, so we didn’t have to scavenge for wood very often. I’m sure fires and asthma don’t mix well. I am a little jealous that you live in Phoenix–though we’ve just come out of 6 months of gorgeous weather, so I have to keep reminding myself of that as we go into the upcoming 6 months of cold. We have a fireplace but we rarely use it. I keep heat bills low by insulating well and turning the thermostat down. We do pretty well all things considered. But we love getting super toasty sometimes by the fire. You’re right–insulating and turning back the thermostat make a huge difference. Right now, we live in a Southern City, so I don’t have much interest in upgrading our heating situation. However, if we move back to Minnesota, I would definitely consider a wood-burning stove. I think they are fun and beautiful, and like you mentioned, its not too tough to get free wood. I’m jealous of your warm city! My neighbors have a wood burning stove and it seems like a great way to heat your home in the Winter. Especially here in Minnesota, it can also be a great way to protect yourself during emergencies. 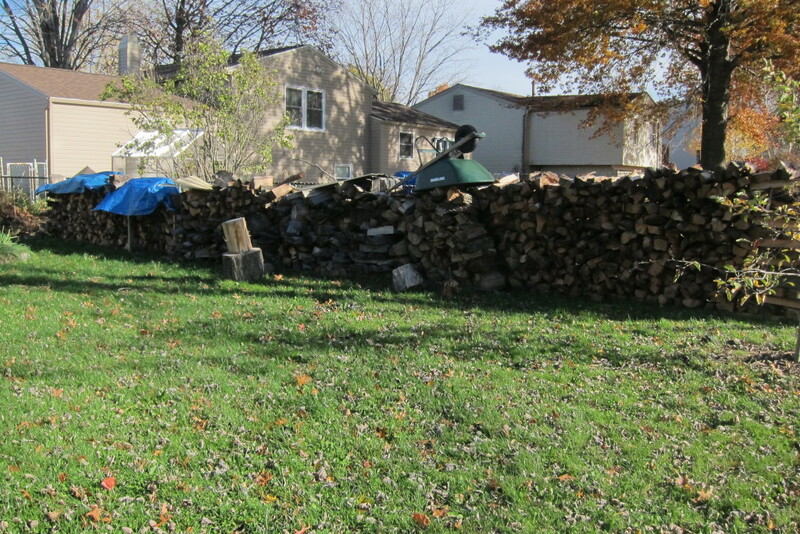 Someone asked if we’re “preppers” when they saw our wood pile. We’re not in the sense they meant, but certainly they’d want to come to our house in an emergency. We are saving toward a wood burning cook stove. Its primary use is to heat, but if power goes out, you can also cook on it too! For gathering firewood, I second CL. You can get good deals & you’d be surprised how many people are looking for people to haul away downed trees in their yards. The big advantage here is it saves time in addition to money. One year we paid a couple bucks for a permit to scavenge forest land for fallen trees. We got some good finds, but it is very time intensive as the “low hanging fruit” has probably already been picked up in years prior. Wood burning stoves are awesome–that s great you can cook on it if needed. I’ve never tried the park method but we’ll have to look into it if our sources run out. It’d be a good excuse to make it to the national park more often. We love our wood burning stove. We have a gas furnace as well, but gas it super expensive in our mountain area, so we try to keep the thermostat as low as possible (usually 55) and burn wood for heat as much as possible. Unfortunately, because it’s cold here and most everyone has a wood stove, there’s no such thing as free firewood around here from the sources you mentioned. But it is cheap to get a US Forest Service permit to get downed wood out of select forests to burn as firewood, which also helps reduce the wildfire danger. We haven’t had time to take advantage of that while working, but it’s definitely on our list for early retirement! Sounds like the demand for wood is completely different in your area, but that’s great you can still save even with purchasing wood. I agree that it’s fun to be on the alert for free fuel! I love our woodburning fireplace! Mr. Smith has been doing a great job at finding free firewood and continues his efforts to stock up before it starts snowing. Although, we don’t have nearly as much as you do, great job! That’s great he’s able to gather free wood before winter. Dive the dumpster behind a furniture making business. All the scraps you need already cut up. I heard fireplaces can actually be energy-inefficient because it lets heat from other areas of the house escape. My realtor said that anyway. Yes, fireplaces have efficiency drawbacks, which is why people don’t primarily heat through them. However, the heat exchanger insert in ours does direct a lot more heat back into our home and our furnace does take a break when we have a good fire going. It is much more for the ambiance than anything, though. And if we’re going to make fires, we might as well get free firewood when it’s possible!